Americans say they are proud of the U.S. actions in Iraq so far, and their optimism about the duration and cost of the war is holding steady. Despite the first reports of U.S. casualties, those interviewed Saturday support the military action in Iraq, and view removing Saddam Hussein as worth the possible loss of life and other costs of the war. A slim majority of Americans support the President's policy of pre-emptive military action by the U.S., but the public is less willing to give other countries that same right. Just over half of Americans agree with the President's policy of pre-emptive military action, but sizable minorities do not. 52 percent say the U.S. should be able to attack any country that it believes may attack it first, without having to wait for that country to attack the U.S. Americans are less willing to bestow this right to other nations, however. Should U.S. launch pre-emptive attacks? Support for pre-emption by both the U.S. and by other countries has increased in the past few months, perhaps because Americans have heard more about the justification for a pre-emptive military strike against Iraq from the Bush Administration. As the war progresses, support for U.S. military action against Iraq is steady and remains fairly high. 76 percent approved of military action against Iraq on Saturday, the same proportion as did earlier in the week. There are partisan divisions on support for the war, although a majority of both Democrats and Republicans interviewed in the three days since the war began approve of the U.S. military action. 94 percent of Republicans approve of it; so do 63 percent of Democrats and 71 percent of Independents. Unlike the 1991 Gulf War, when Americans were willing to target areas with large civilian populations, most Americans now want to limit bombing raids to military targets and avoid bombing of civilian areas. Right now, most Americans think the government is using the right amount of force against Iraq, but 20 percent think it should use even more. Men (26 percent) are more likely than women (15 percent) to advocate using increased force. USE OF FORCE BY U.S.
Reports of the very first casualties from the battlefield did not deter Americans' support for regime change in Iraq. In fact, their belief that removing Saddam Hussein from power is worth the loss of life and other costs has increased since the war began. Americans thus far see no reason to change their expectations about future casualties. Most believe the U.S. will lose less than 1,000 troops. U.S. and allied forces continue to make progress toward Baghdad and many Iraqis have surrendered, but the Pentagon has cautioned that tough fighting may still lie ahead. However, Americans' views on the length of the war remains unchanged, with 62 percent saying they think it will be both quick and successful. Most Americans feel proud about what the U.S. is doing in the war with Iraq; 63 percent say they are proud, and 28 percent are not feeling proud. Behind these figures lie some partisan and gender differences, however. Overwhelming numbers of Republicans are proud, but Democrats are split. Men are more likely to feel proud than women. ARE YOU PROUD OF U.S. ACTIONS IN IRAQ? However, in 1991 Americans were even prouder of their country's actions. Then, 74 percent said they were proud, and 17 percent were not. Americans remain on edge thinking about another terrorist attack. The fact that one did not occur in the opening two days of the war has not calmed fears, and a large majority is still apprehensive. Americans felt much the same way at the start of the first Gulf War in 1991. About two-thirds of Americans think the U.S. is generally prepared for another attack. However, Americans are not so confident in their own area. As many state and local governments call for greater resources to help them in anti-terrorism efforts, Americans are less certain that their own local government is ready. IS GOVERNMENT PREPARED FOR ANOTHER ATTACK? 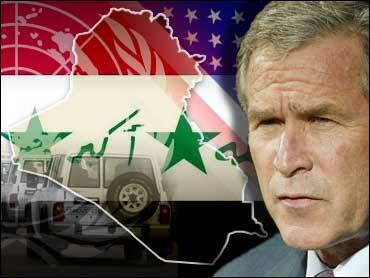 The war in Iraq is making Americans personally less nervous this time around than during the 1991 Gulf War. Today, 27 percent say they are nervous or edgy, or even losing sleep, because of the war. In 1991, 39 percent said they were. IS WAR MAKING YOU EDGY, NERVOUS OR SLEEPLESS? Fewer Americans are altering their schedules to watch coverage of this war than did so in 1991. Today, 43 percent say they are changing their schedules -- either rising early or staying up past their bedtime -- to see reports, while at this point in the 1991 war, 77percent said they were doing so. Anti-war protestors gathered again in American cities Saturday, and the public continues to say that those protestors have a right to express themselves, though that sentiment is now slipping a bit. 59 percent of Americans think protest marchers have a right to express their views, down from 64 percent Thursday and Friday, while 29 percent think these protesters will hurt the war effort. This remains a sharp difference from 1991; in the first Gulf War just 48 percent said protesters should be able to march. But the same rules apparently do not apply to those who want to become the next Commander-in-Chief. Just 32 percent of Americans think that Democratic presidential candidates who oppose the war should speak out at this time, and a majority – 55 percent -- say such actions would hurt the war effort. These beliefs are not entirely driven by partisanship: two-thirds of Republicans think anti-war Democratic candidates hurt the war effort, and Democrats are evenly divided on the matter. SHOULD ANTI-WAR DEMOCRATIC CANDIDATES SPEAK OUT AGAINST WAR? President George W. Bush's approval ratings jumped up as he issued his ultimatum to Saddam Hussein early last week; those higher ratings are holding steady. With the U.S.' success in the early goings, the President's rating on his handling of the Iraq situation has crept up slightly. The President's ratings on the economy, however, continue to be his weak point, remaining below the 50 percent mark. 48 percent of Americans say Bush is paying as much attention to the economy as he can during this time of war; another 46 percent say he needs to be paying more, regardless. At the end of the Persian Gulf War, 55 percent thought then-President George H.W. Bush was paying as much attention as he could to the economy, while 38 percent thought he should be paying more attention. IS PRESIDENT PAYING AS MUCH ATTENTION AS HE SHOULD TO ECONOMY? This poll was conducted among a nationwide random sample of 516 adults, interviewed by telephone March 22, 2003. The error due to sampling for results based on the entire sample could be plus or minus four percentage points. Sampling error for subgroups may be higher. Some questions (where indicated) are based on three days' worth of interviews; those interviews were conducted among 1,351 adults from March 20-22; the sampling error is plus or minus three percentage points.